Ask any makeup junkie about the benefits of setting sprays and you'll probably get a list long enough to convince you to go buy yourself a bottle immediately. And the hype is real, a good setting spray goes a long way in the makeup world. From acting as a moisturiser to priming your skin and making your makeup stay in place all day long. 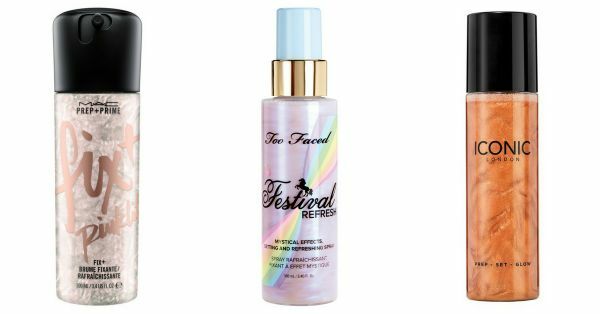 A setting spray is pretty great to even refresh your face on the go. A good setting spray gives your makeup a boost by melting in all of the products seamlessly. It can also be used to get more pigment from your powder highlighters and eyeshadows. So now that we've established the splurge-worthiness of a basic setting spray, let me introduce you to the latest entrant in the world of makeup - A shimmering setting spray. A shimmering setting spray is essentially just that, a setting spray with a hint of shimmer in it to give your skin a boost of glow. If used correctly, it enhances your complexion, acts as a highlighter and can be used on your face and body. If you're constantly on the go and don't often have time for an elaborate makeup routine, a shimmering setting spray will give your skin a glow. You can use it before you begin your makeup and lightly mist it over your finished makeup. Your skin will look absolutely phenomenal in photos and real life too. If you're going on vacation, this could be a pretty great handbag essential. Spritz it on your neck, shoulders, legs and your whole body will be radiating a healthy glow. But do keep in mind that it does have a little bit of shimmer. Steer clear of a shimmering setting spray if you have large pores or texture on your face as this may accentuate them. I'm a complete makeup junkie, and if this product is versatile enough to be used in place of a highlighter, I'm sold. Here are some shimmer setting sprays you could indulge yourself with!